Last Day: 100% Pure offers 7-pc full size free gift set ($113 value) with any $35 purchase. No code needed. Ends Nov 8. Bath & Body Works offers 20% off sitewide. Enter code HOLIDAY2012 at checkout. Valid thru Nov 9. Beauty Sak offers $10 off, free shipping, plus a free deluxe sample of Molton Brown Bath & Shower Gel or Hand Wash. Enter code MB12 at checkout. While supplies last. Benefit Cosmetics offers free full size Ultra Shines Lip Gloss of your choice of shade with any $50 purchase. Enter NUDIE, FRISKY or FUCHSIA at checkout. Valid thru Nov 14. 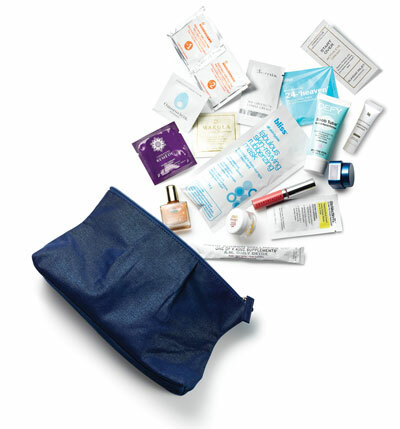 Bliss offers a free limited edition cosmetic bag filled with travel-sized head to toe beauty goodies ($160 value) with any $150 purchase. Enter code HAPPYHDAY at checkout. While supplies last. Extended: Butter London offers 30% off Friends & Family event. Enter code FRIENDS12 at checkout. Valid thru Nov 11. Estee Lauder offers free Refine & Rehydrate Duo with any $35 purchase. Gift includes deluxe sample of Idealist Refiner and Hydrationist Cream. Enter code REHYDRATE at checkout. Valid thru Nov 11. Their holiday gift sets are online now as well! Folica offers 20% off Holiday Gifts selection. Enter code GIFTS20 at checkout. Valid thru Nov 12. Peter Thomas Roth offers an exclusive 3-pc Un-Wrinkle Kit for $110 ($185 value). No code needed. While supplies last. Limited Quantities: PopSugar Must Have offers a new Luxury Edition Box for $100, ships by 24th Dec. (I ordered mine and am super excited about it!) Their monthly subscription box is $35 for over $100 value of lifestyle products. Use code REFER5 for $5 off your 1st month of usual monthly subscription. Skyn Iceland offers free Anti-Blemish Gel ($25 value) with any $45 purchase. Enter code FREEGEL at checkout. Valid thru Nov 14.